As industrial moves from being an operations decision to a financial product, it’s no longer a sleepy backwater of the investment world. Institutional Capital has permanently changed markets from locally owned and operated to globally owned and tenanted. It’s a 40-year trend beginning with the first wave of Japanese corporations and now exploding with institutional capital since the 2008 Financial Crisis. The influence of institutional capital makes it a different business. The driver is no longer business operations but financialization. 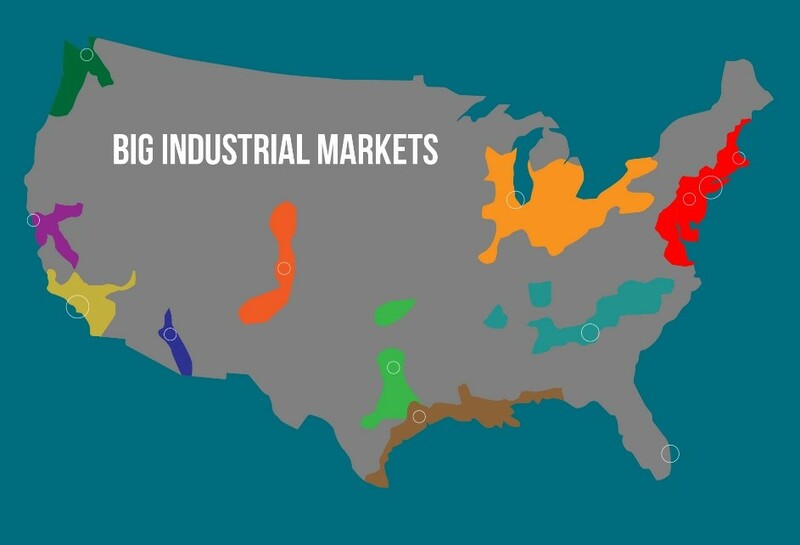 Institutional activity is concentrated in several industrial regions and nodes only. All other areas of the country are virtually excluded from capital firepower. Size and building quality are also factors but deficiencies can be financed away by a few extra basis points in core markets. Institutional capital is disrupting local markets the same way that Tech disrupts business and society. The result is institutional capital is rapidly taking away opportunities from everyone else. 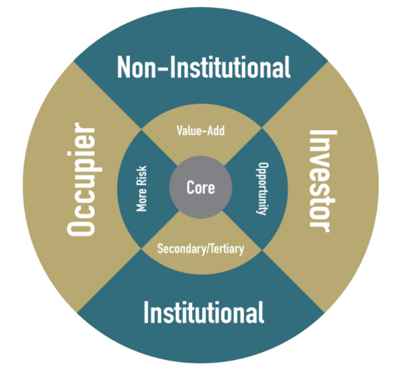 At the same time, institutional penetration helps other building owners by establishing professional conditions to grow asset values. The influence of Big Capital, particularly here in Los Angeles, is influencing the decisions of investors, occupiers, and an overlooked role, stewards. As markets turn from local to institutional, there are not enough buildings to purchase for all the money pouring in. Once markets turn institutional, the rules change. Much is positive because of better asset management, maintenance, and appearance. At the same time, individual landlords disappear, fewer buildings are available for owner/users, and there are less ways to build personal real estate wealth. Private investors have opportunities with a tenant in tow, relationships, timing, or special insight. However, on an open bid to all comers, individual buyers lose out. Big Investors have a similar problem because they face off against each other. Today, there are 15 groups who can write a $75 million check, but just as disruptive, institutions work equally hard for a $5 million deal. Lots of money and shortage of product result in individual building owners being tirelessly contacted. If it weren’t for Capital Gains, many more would have sold by now. Where to go for deals? It’s the same answer if you are a big or a small investor. Small buildings, further infill, and alternate markets all have opportunities without institutional interference. Look for pockets below the radar. It may not be a bad idea to wait for counter-cyclical opportunities in the next slow down. In particular, avoid selling what you already have, an institutional asset in personal possession. It’s the Occupiers whose rent supports the investors, but surging rents and lack of space removes any reason for reciprocation. Generally, most Occupiers are in the markets so infrequently they are often reactive and under duress. Conversely, experienced Occupiers know how to turn the flood of institutional capital to their favor by leveraging a strong balance sheet for long term space commitments. The other advantage Occupiers have is being in the market, at that moment, with real time data. By using market knowledge strategically, Occupiers can tell which landlords are open to deal at that moment. Precise market data and the ability to supply immediate rental cash flow is what gets deals done for Occupiers. Tenants are ranked. For instance, a major credit tenant on a 10-year lease is worth much more than a local credit on a 3-year lease. To strike a balance, Landlords will ask more from weaker tenants in the form of higher rent, increases, and additional security. It’s nothing personal, but when institutions look to raise cash, capital markets will underwrite the portfolio based on rents, credit quality and enhancements. This is a good example how institutions are changing the business. 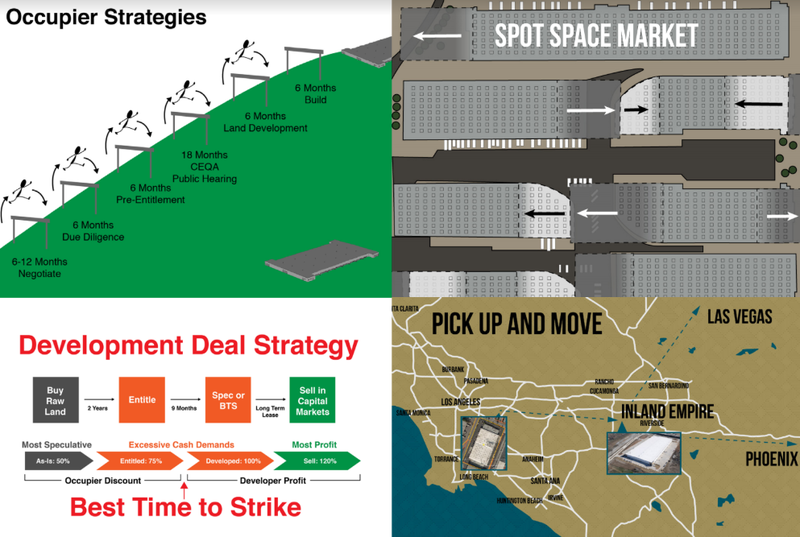 The difficulty for Occupiers is how to make the best operating decisions for the business. Choices are constrained by availability and the conditions of capital. Traditional goals to maximize competitive strategy are restrained. For example, the conventional matrix of transport, rivals, suppliers, customers and labor is sacrificed by the necessity of finding space, any space. It often leads to a location that is less than ideal. The third very common decision type I see is made by Stewards. Steward is an old English property role partially mixed with religious virtue to serve the ownership interests (mostly family ones) but with an equal obligation to tenants and the general community. Stewardship does not primarily maximize profit but its purpose is to retain the asset into perpetuity for future generations. Many stewards don’t realize they have taken this role by their conscious decisions. The most common cases are the managing members of family partnerships, but stewards are also in charge of foundations, religious and academic institutions, non-profits, corporates, trusts and municipal interests. Stewards often run properties with a low basis from legacy acquisitions of another era. Managed with low debt with an eye to future generations, the challenge is expanding beneficiary needs without the commensurate increase of income. The steward’s decisions can appear non-economic but that is because they are risk averse and have testamentary obligations. There are additional temptations to sell those assets because of strong industrial real estate prices. Stewards tend to think internally, making decisions to satisfy the immediate income needs of family beneficiaries, often to the detriment of long-term asset growth. Stewards are forced to put off expensive capital improvements, avoid standard vacancy periods, and take unfavorable market actions because of immediate demands. Most stewards don’t have the luxury to make long term beneficial decisions. Either through ignorance or neglect, many simple provisions are ignored. Enforcement of lease terms particularly late fees, maintenance requirements and service contracts are in every lease but overlooked. As difficult as it is, contributing to a capital fund will maintain building condition to achieve top rents. Many of the assets in family control are irreplaceable. More times than not, the steward is a reluctant leader that will let the asset deteriorate to avoid family entanglements. The antidote is to operate the property with professional management, officers, and written agreements. There is a strong contrast between Institutional ownership and family stewards, but the latter can learn from the former to keep the property earning for generations that follow. This entry was posted in Uncategorized on January 11, 2019 by Nawshad Jamil.